Your hosts John and Kay Searle, Richard Wallis and Catherine Woods proudly welcome you to the Cromwell TOP 10 Holiday Park. 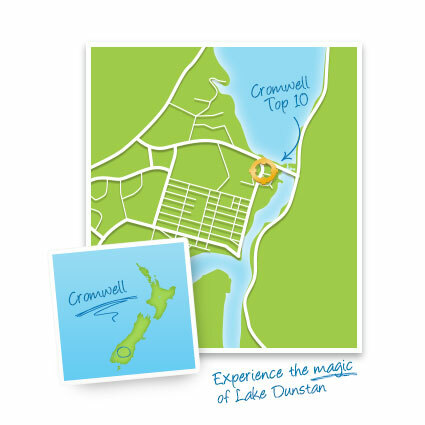 Cromwell TOP 10 Holiday Park camping ground is set on spacious park-like grounds, blessed with a hot summer climate and fabulous sightseeing plus surrounded by great lakes and rivers. Our Cromwell location has us within close proximity to Wanaka, Queenstown, Alexandra and Clyde, all within a 1 hour drive. We are also central to five major ski fields which makes Cromwell TOP 10 Holiday Park the perfect place to base your Central Otago, NZ holiday from. At the Cromwell TOP 10 Holiday Park you will find modern amenities, clean facilities and warm, comfortable Cromwell accommodation to suit any budget. From park motel units to self-contained units and powered and tent sites, we have something for everyone. One of the most beautiful holiday parks, our spacious tree-lined grounds are quiet and peaceful with tons of room for campers and campervans alike. From the park, you can admire the picturesque views of the surrounding mountain landscapes. With the beautiful Lake Dunstan on our doorstep, we are ideally placed for all kinds of water sports and recreational activities... or just relaxing on its shores. You can be assured the kids won’t get bored here with the large adventure playground and huge jumping pillow. There is so much to see and do outdoors, we have a range of brochures to look through to help you decide what to do, or just get cosy inside with a book or some fun games. So come and stay with us at the Cromwell TOP 10 Holiday Park, relax and enjoy the easier pace of life in Central Otago, New Zealand.